Chao Yuen Ren (趙元任, 1892-1982) is mainly remembered as a pioneer of Chinese linguistics and a May-Fourth intellectual. Yet, his career actually reveals an understudied aspect of science and technology in modern China: the “soundscape” (i.e., the humanistic environment and material culture that produced, perceived, and made sense of sound and voice) of his time. In this talk, I will review Chao’s four major undertakings related to sound and voice. First, I examine his phonetic research, dialect surveys, and representation scheme of tones. Second, I analyze his advocacy of a national oral language, including his Romanization of Chinese characters. Third, I discuss his involvement in performing arts, including music and drama. Fourth, I explore his interest in, experience with, and attempt to improve sound reproducing technologies such as phonograph, broadcasting, and spectrographic “visible” speech. 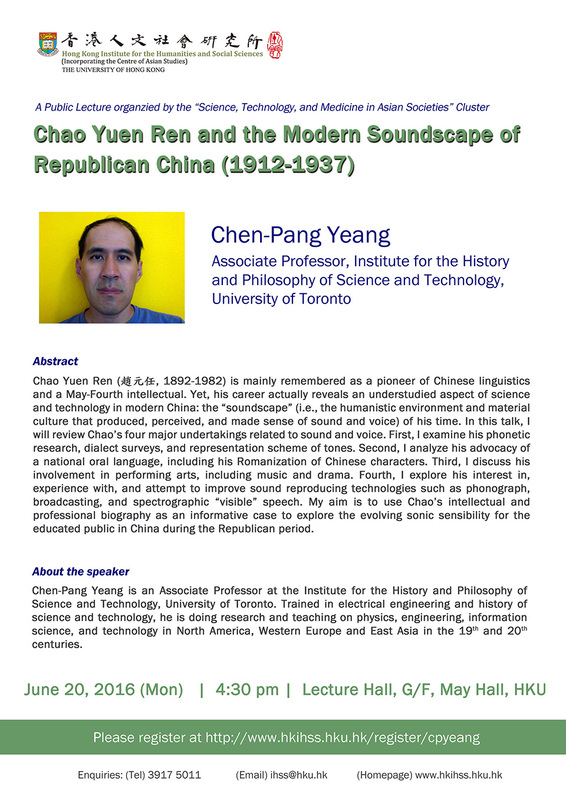 My aim is to use Chao’s intellectual and professional biography as an informative case to explore the evolving sonic sensibility for the educated public in China during the Republican period. Chao Yuen Ren (趙元任, 1892 – 1982) is mainly remembered as a pioneer of Chinese linguistics and a May-Fourth intellectual. 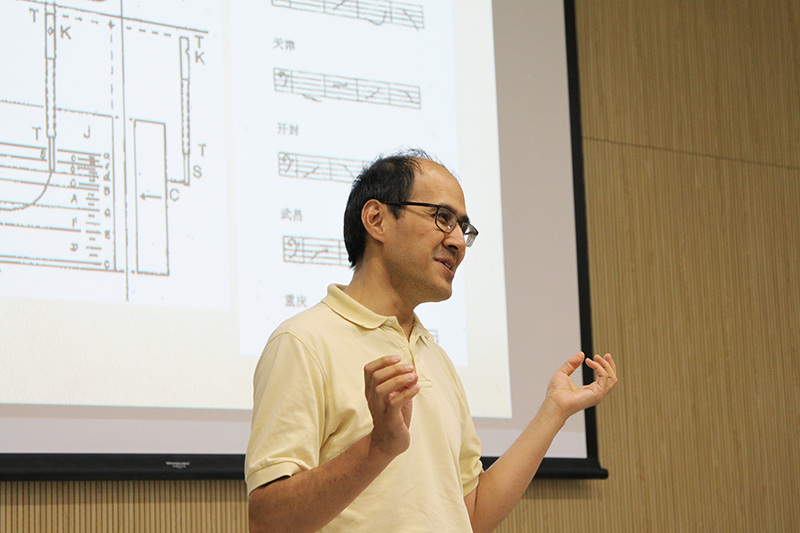 Yet, his career actually reveals an understudied aspect of science and technology in modern China: the “soundscape” (i.e., the humanistic environment and material culture that produced, perceived, and made sense of sound and voice) of his time. In this talk, I will review Chao’s four major undertakings related to sound and voice. First, I examine his phonetic research, dialect surveys, and representation scheme of tones. Second, I analyze his advocacy of a national oral language, including his Romanization of Chinese characters. Third, I discuss his involvement in performing arts, including music and drama. Fourth, I explore his interest in, experience with, and attempt to improve sound reproducing technologies such as phonograph, broadcasting, and spectrographic “visible” speech. My aim is to use Chao’s intellectual and professional biography as an informative case to explore the evolving sonic sensibility for the educated public in China during the Republican period. 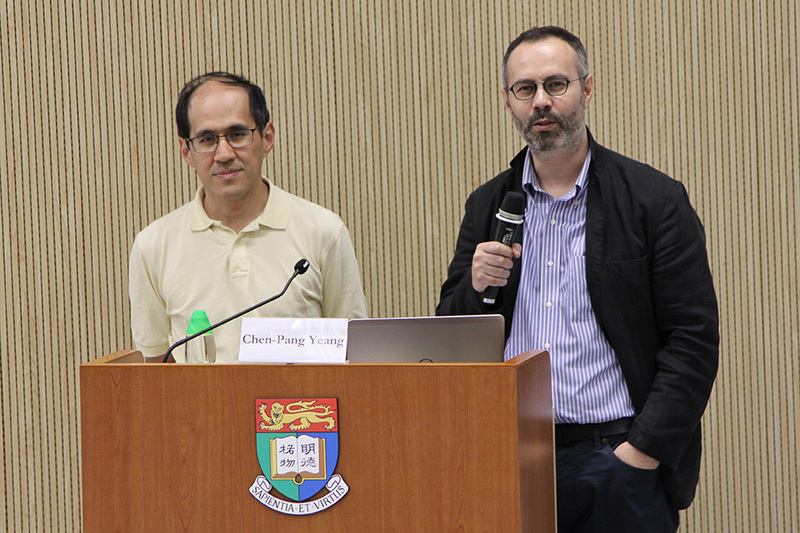 Chen-Pang Yeang is an Associate Professor at the Institute for the History and Philosophy of Science and Technology, University of Toronto. 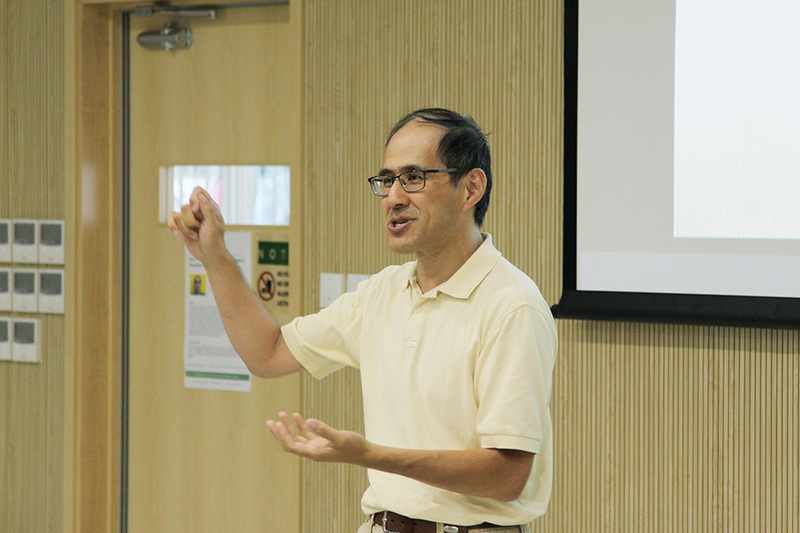 Trained in electrical engineering and history of science and technology, he is doing research and teaching on physics, engineering, information science, and technology in North America, Western Europe and East Asia in the 19th and 20th centuries.